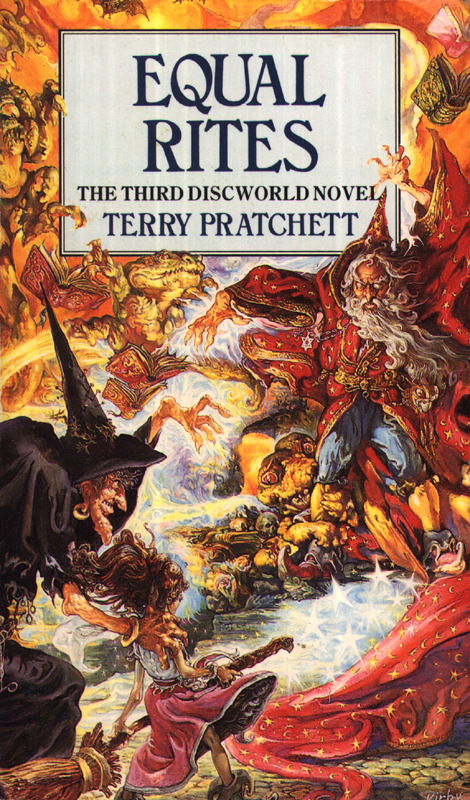 It's been a while since I read anything Discworld, and considering that I have a rather stressful move looming on the horizon, I thought that now might be a good time to continue with the series, as I have enjoyed Pratchett's work in the past and I wanted something that I could relax with. Drum Billet is a wizard who knows that he is going to die. Armed with this knowledge, he sets out to pass on his magic staff to the eighth son of an eighth son, as is traditional amongst wizard circles. It is only after the wizard has passed on the staff and departed this mortal coil that people find out that the newborn is, in fact, a baby girl. Absolutely mortified by this turn of events, the local witch Granny Weatherwax decides that the girl will grow up to be a perfectly ordinary witch. But when young Eskarina starts using magic that is decidedly unlike witchcraft, it becomes evident that she will need to be taught at the Unseen University, home to a wholly male alumni. I knew that Equal Rites would be funny, I mean it's what Terry Pratchett was known for throughout his writing career. Even the essays that I've found of his are funny. What I had kind of forgotten was just how insightful and utterly relevant Pratchett could be. That second part might seem a bit of a weird choice of wording, but I think it's the closest I can describe it. I mean, if you boil Equal Rites down to its base themes, it isn't about magic. Sure, the magic is a big part of it, but it is ultimately part of the setting, and you could probably rewrite this plot within a different genre or universe. Ultimately, Equal Rites is about the struggle of women entering the world of academia, specifically fields that are traditionally male-dominated. I know this will sound over-the-top, but that just blows me away. I absolutely love that this is the focus that Pratchett went for, because I cannot think of any other stories like it. And considering the fact that we still get news stories about how difficult it is to attract women to study STEM subjects, there really should be more stories tackling this subject. I think that while Terry Pratchett's humour is the element that people will recommend his books for, and I reiterate that it is very good, it is his social commentary that keeps his novels memorable and relevant even after nearly 30 years. I will mention that Equal Rites does still feel like he's working out how the Discworld works sometimes. It's an issue that I had with the first two installments of the series, but it's less noticeable here. Having heard so much enthusiasm about the witches from my fiance though, I was a little surprised to only meet Granny Weatherwax. I can only hope that he settled into the groove a little more with the next few novels, as I do want to explore more of the Discworld soon.